Sherlock Holmes, in his debut appearance in A Study in Scarlet, quipped: “It is a capital mistake to theorize before one has data." The popular discourse surrounding technology trends is dominated by buzzwords and a promise to change the world. In this scenario, decision makers find themselves struggling to differentiate between hype and reality. Acknowledging this environment, we decided to conduct a study to identify the tech innovations that enterprises should watch out for and why. We began with a list of 12 technologies, going deeper to identify the major trends. We chose to keep things simple by using two axes to classify each trend. 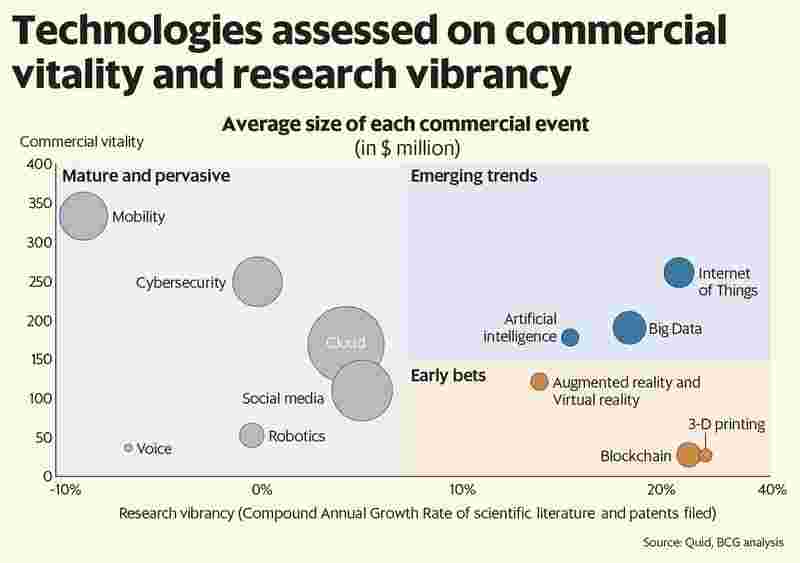 First, there should be vibrant research activity happening in the technology, including but not limited to intellectual horsepower invested in patents and scientific papers. Second, the technology should have potential commercial momentum and use cases that provide end users with value. We used the number and the size of commercial vitality events (initial public offerings, mergers, coin offerings in case of blockchain) witnessed in each tech as a surrogate for commercial value. Using this combination of intellectual and commercial measurement, our study has filtered out the hype while sticking to the reality. Three broad clusters emerged as we evaluated the technologies along the two dimensions of research vibrancy and commercial vitality. Plotting each technology threw up interesting results. For example, Big Data continues to drive far greater research, patents and intellectual property, compared to its bedfellows Cloud and Mobility. Going deeper, it appears that innovation is actually being spurred by artificial intelligence (AI) and that its urgent need for data is fuelling a growth spurt for Big Data. Similarly, Voice is still in its nascent stages but clearly on its way to becoming a trend if and when it reaches the Android era. The explosion of Android (and some would argue consequently smartphones) was driven by the twin flexibilities of both platform and the apps open for developers to tinker with. In this article, we focus on two emerging trends (AI and Internet of Things, or IoT) and one early bet (blockchain). Rarely has a technology gripped public discourse as much as AI. The last time the general public was so intrigued by a technology was probably when computerization became a trend itself. Investors poured in $15.2 billion globally (a 141% jump from 2016) in AI start-ups across industries in 2017. BCG recently conducted a survey jointly with MIT Sloan Management Review to assess companies on their AI ambitions and efforts. Our survey revealed a large gap between AI ambition and reality, signalling an eagerness to bridge the gap between the two. As per the survey, 23% of the companies have incorporated AI in their processes and offerings (with some varying degrees) and another 23% have kick-started pilots. Further analysis of the survey data revealed that the impact of AI disruption is not uniformly distributed across industries. While technology-media-telecom, consumer, and financial services will see a higher impact on their offerings and processes, the energy and public sector will see comparatively less of it. For each major industry, our study identified the top three functional areas that warrant attention from corporations and technology investment. The commoditization of AI has begun. Google, Microsoft and Amazon now offer cloud-based AI as a service. Developers can bring their own data to train the algorithms to suit their specific needs. The technological complexities are being abstracted, hence allowing developers to focus on the functional tweaks necessary for AI to deliver value in their specific use case. We have started seeing the adoption of AI among our clients. For instance, a Malaysian Bank used machine learning to identify which existing retail customers have the propensity to buy life insurance. Even within India, a top private bank deployed AI to transform the operating model across retail and corporate banking. It has resulted in cost efficiencies and increased productivity in operations by 20%. Customer delight has also gone up as AI allows 24x7 processing and reducing turnaround time by 50-60%. The bank is now investing in an AI lab and sees it as a way to stop backfilling naturally high attrition roles. While major economies like the US (with China playing catch-up) may have a head start in AI, India Inc. and the start-up community is displaying a keen interest (AI focused start-ups are the fastest growing at 75%, says a Nasscom-led report). The recent announcement by the Indian government to establish a National Programme on AI under the aegis of NITI Aayog further underscores that AI is an important emerging technology. The key components needed for IoT have existed for quite some time and are mature now—for instance, the inexpensive sensors required to convert analogue to digital, the reliable networks to transmit, and the intelligent analytics to process as well as decide. It is the full stack coming together that has allowed IoT to become a trend. A 2017 BCG study estimated that firms will incrementally spend $250 billion on IoT by 2020. It also predicted that manufacturing and logistics would together account for almost 50% of the IoT spend and the top use cases—predictive maintenance, fleet management, self-optimizing production—reflect this. Our experience in India mirrors the observations of this global study. For instance, a large industrial goods company in India has picked up around 20 IoT use cases across the manufacturing and logistics value chain. This organization suffered massive demurrages and frequent stock-outs at the plant due to manual coordination among various operators managing discrete parts of a complex supply network (imagine several million tonnes of raw material riding mother vessels, barges, jetties and conveyors from the port to the plant). IoT-enabled devices are allowing real-time position tracking to improve production planning and scheduling—driving close to 50% reduction in demurrages and a 100% elimination of stock-outs. The Insurance Regulatory and Development Authority of India has set up a working group to study the role of IoT devices in the insurance sector. In developed markets, IoT devices have enabled interesting product innovation. For instance, in developed markets, “pay as you drive" or even “pay how you drive" motor insurance is available. It is no surprise that the government recently announced a special 13-digit mobile number for the SIMs that power IoT devices connected to GSM networks. The ministry of electronics and information technology recently estimated that two billion-plus IoT devices are expected to be functional in India in the next three-four years—a 10x jump from the current 200 million! We have witnessed two waves where initially scarce and expensive resources became cheap. Consequently, technologies emerged to exploit these resources. When computation (transistors) became cheap, PCs (personal computers) emerged; when bandwidth became cheap, the internet emerged. Blockchain is the third wave where cheap storage has allowed us to create a distributed, open to all (yet secure) way of recording important information. For the first time (at least on this scale), it is possible to issue and transfer assets in the virtual world by using the distributed ledger to record ownership and to establish continuity. Blockchain was synonymous with cryptocurrency until boardrooms started adopting use cases in more day-to-day enterprise functions, such as fraud control, patent tracking and invoice automation. In India, several promising applications of blockchain are being tested. Financial services seem to be leading, with life insurers and banks trying out a blockchain-based repository of common information—for instance, know your customer. A general insurer has launched a blockchain-based product to proactively (and with minimal documentation) settle travel insurance claims. There are some early experiments of using blockchain in the supply chain that executives must closely watch. We must, however, warn you that scaling up could be a serious problem for blockchain. For one, even mature applications like bitcoins process a measly 10-14 transactions per second. Enterprise-grade applications routinely handle hundreds, and often thousands, of transactions per second. Another issue is the fact that, by design, blockchains are “exponentially wasteful", and while storage and computation may be cheap, electricity is not. A report by Morgan Stanley states that bitcoin is likely to use 125 terawatt hours of electricity in 2018. The plethora of mobile apps, the draw of cloud computing, the powers of Big Data and analytics, or the infectious nature of social media are all well-established technologies now—and common place in organizations. Although several organizations (especially in India) are yet to harness the full potential of these technologies, these are increasingly becoming obvious table stakes. We believe it is the silent but fast emerging technologies including AI, IoT and blockchain that are likely to become differentiators for the haves and the have-nots in the industry. Rajiv Gupta is a partner and leads the technology advantage practice at the Boston Consulting Group (BCG) India. Amit Bharti and Rachit Chandra are project leaders with BCG. The views expressed are personal.